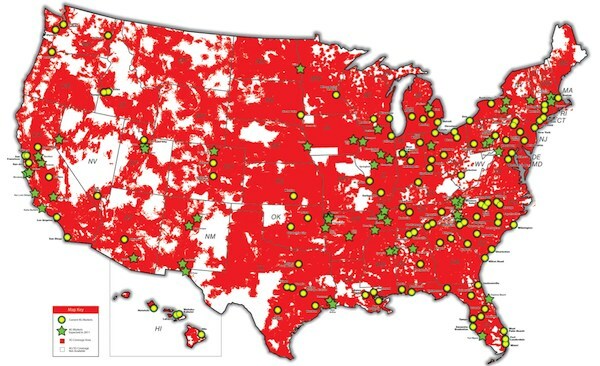 Verizon, the ever-expanding wireless network expands its LTE network even more, reaching to over half of America! Verizon LTE. The network. The absolute best, and ever expanding network means a wide range of possibilities. AT&T may own a boat load of customers, but there calling network can’t hold a boat load. 160 million Americans to be exact. And with 15 new markets on hand, this company’s striving to take vengeance from Ye ‘Ol AT&T there. Check out the press release via engadget below. BASKING RIDGE, N.J., Aug. 17, 2011 /PRNewswire/ — Verizon Wireless is turning on the world’s most advanced wireless network in 15 additional cities and expanding its network in 10 cities on Aug. 18, bringing the blazingly fast speed of 4G LTE to more than 160 million Americans – more than half the U.S. population – in fewer than eight months. Consumers and businesses can choose from an array of 4G LTE-enabled smartphones, tablets, notebooks and netbooks, and hotspots to connect to the fastest 4G LTE network in the country, now available in 117 cities. * Greater Fairfield and New Haven, Conn.
* West Palm Beach, Fla.
* Greensboro-Winston Salem-High Point, N.C.
Minecraft. The computer game that’s abducted millions to it’s core has now gone one step ahead. Mobile Minecraft, or Minecraft Pocket Addition, has now hit shelves on the ever-expanding Android Market. Why so big news? This takes Minecraft to a whole new device. Android, especially. The controls seem to be pretty well-built, too. The app was launched this morning, and has taken way by many, few who’ve commented and rated this device ★★★★★. You can check out this app and download it on the Android Market. Get it today!